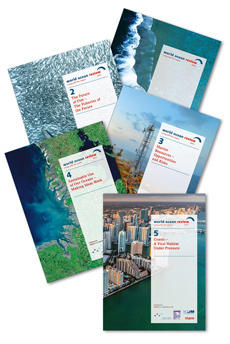 > Worldwide there are dozens of different institutions dealing with the use or protection of the sea. These include multinational organizations like the United Nations and, of course, national governments themselves. The fragmentation of responsibilities makes it harder to ensure that use of the sea is entirely sustainable. Experts are therefore trying to define universally applicable rules for good governance of the sea. 3.1 > A factory ship where fish are processed on board. Whether this large-scale industrial form of fishery contributes to the decline of a fish population depends on the condition of that population to begin with. TERRITORIAL SEA: The territorial sea is the 12-nautical-mile zone. It belongs to a state’s sovereign territory, and the right of peaceful passage prevails for international shipping. The other activities in this zone are subject to the legislation of the specific states. Legislation must be in line with internationally agreed rules provided that the state has ratified UNCLOS. EXCLUSIVE ECONOMIC ZONE (EEZ): This extends from the outer edge of the territorial sea to a distance of 200 nautical miles (approximately 370 kilometres) offshore. Therefore the EEZ is also called the 200-nautical-mile zone. Included within the EEZ are the sea floor and the water column. Unlike the territorial sea, the EEZ is not part of a state’s sovereign territory. Nevertheless, in its own EEZ only the coastal state may extract resources such as petroleum and natural gas, mineral resources and, of course, fish stocks. Other nations may only use the re-sources if the coastal state consents. Resource extraction in the EEZ is subject to the coastal state’s legislation, which in turn must be in line with the international rules laid out in UNCLOS. CONTINENTAL SHELF: The continental shelf is the gently or steeply sloping sea floor off the coast, which is a natural geological extension of the mainland. In the case of such a geological formation the country can exploit the sea floor and its mineral resources up to a maximum of 350 nautical miles off the coast. In other words, it can extend its continental shelf rights. 3.2 > The United Nations Convention on the Law of the Sea (UNCLOS) partitions the ocean into different legal zones. Within this framework, the sovereignty of a state diminishes as distance from the coast increases. Adjacent to the inner waters is the territorial sea, which is also known as the 12-nauti-cal-mile zone. Here the coastal state‘s sovereignty is already curtailed, because ships from all countries are allowed passage through these waters. In the exclusive economic zone (EEZ) which extends up to 200 nautical miles from the coast, a coastal state has the sole right to explore and harvest living and non-living resources. It is thus permitted to exploit petroleum and natural gas, mineral resources or fish stocks. 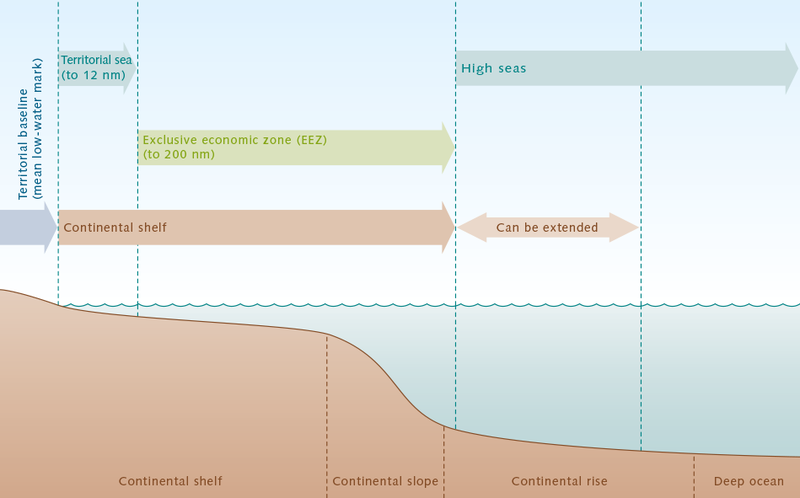 In the continental shelf zone, which is a natural extension of the mainland and can extend beyond the exclusive economic zone, it may explore and harvest resources on the sea floor. Adjacent to the exclusive economic zone is the area of the high seas. 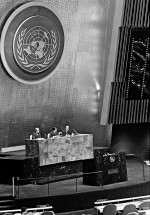 3.3 > A conference on the Convention on the Law of the Sea (UNCLOS), held in March 1982 at the United Nations in New York. UNCLOS is one of the largest legal regimes on ocean governance. This zoning is fundamentally in conflict with any comprehensive sustainable ocean governance. Fish stocks can move across vast areas; toxic substances travel across na­tional borders with sea currents and far beyond the bounds of an EEZ. And finally, as a consequence of climate change and particularly ocean acidification and sea-temperature rise, threats exist today which affect all marine ­areas equally, across all zones and borders. Article 192 of the Convention on the Law of the Sea obliges all states parties to protect and conserve the ma­rine environment. In addition, Article 192 ff. cites a list of obligations, setting out how states are to make use of resources in a sustainable and environmentally benign way and minimize marine pollution. Nevertheless, UNCLOS does not provide any unequivocal definition of sustainability or concrete environmental protection standards. It neither describes in detail how resources are to be used, nor can it determine, for example, catch quotas for fishery. 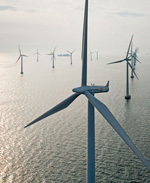 The specifics of environmental protection are left to the individual states parties. This being the case, today it is commonplace for certain coastal states to neglect marine protection due to lack of political interest or lack of financial resources. A consistent global level of protection for the ocean has not been achieved to date. Much the same applies to fishery in the international waters of the high seas. According to the standards set out in UNCLOS, fishery is regulated in most international ma-rine zones by one of the RFMOs. Usually it is the coastal states of a sea region that are organized in these RFMOs, along with just a few larger fishery nations. 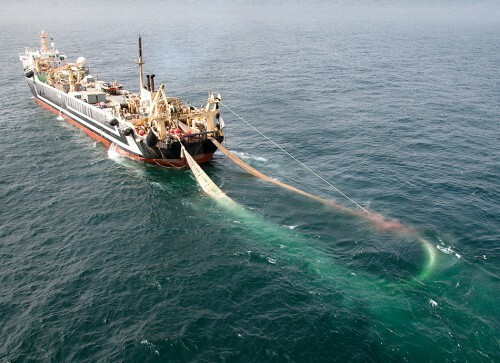 For example, the members of the RFMO responsible for the Northeast Atlantic, the North East Atlantic Fisheries Commission (NEAFC), include the European Union, Iceland, Norway and the Russian Federation. Other nations which do not belong to the RFMO responsible for the given sea area are not actually allowed to fish in that area. Nevertheless, illegal fishing could be taking place in these areas almost ­undetected, since such misconduct is rarely sanctioned. Irrespective of all the regulation of fishery, this means that even fish stocks in RFMO areas can be overfished. A further reason why no comprehensive regime for sus­tainable ocean governance has yet been achieved is that different institutions are responsible for each of the vari-ous types of ocean use. 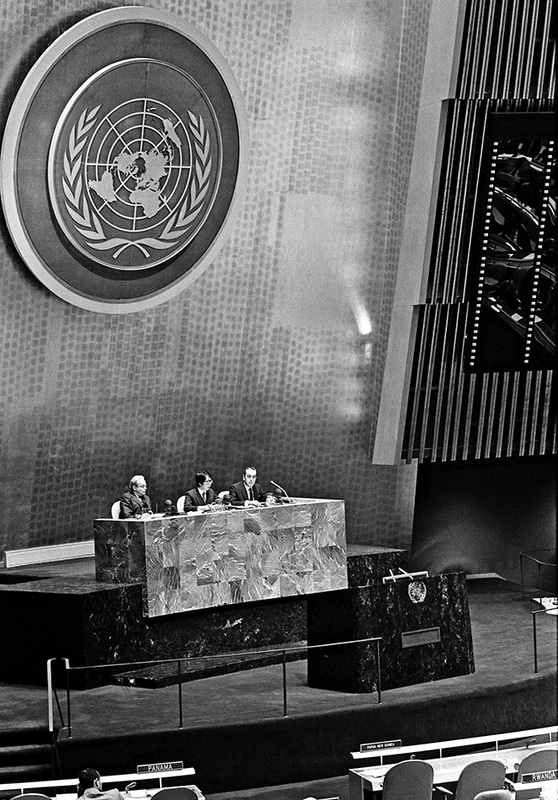 At the highest political level, first of all, there are various institutions under the umbrella of the United Nations (UN) dealing with the various dif­ferent use and protection aspects of the ocean; for example, the ISA headquartered in Kingston, Jamaica, and the International Maritime Organization (IMO) in London which lays down the rules for international commercial ship-ping. These are set out in international treaties, the conventions. One example is the Ballast Water Management Convention. Ballast water is stored in special ships’ tanks. Its purpose is to keep ships stable when they are empty or lightly loaded. Depending on whether a ship in port is being loaded or unloaded, it will either pump ballast water into its tank or drain it back into the coastal waters. 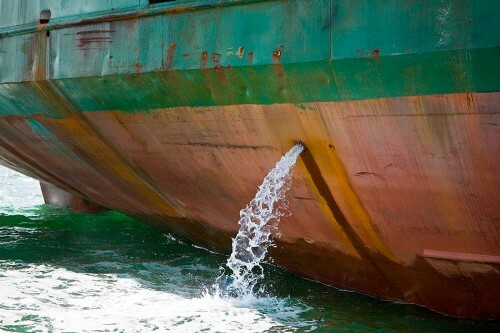 Along with this ballast water, in turn, marine organisms can be carried from one part of the world to another. If they become established there and suppress native species, this can change the nature of entire habitats. In order to combat the incursion of alien species, known as bio-invasion, under the terms of the convention, ballast water must be purified in future with special treatment plants on board ship. 3.5 > Ballast water being pumped out in a harbour. Ballast water can transport bio-invaders from one ecosystem into an-other. Some of the organisms reproduce so prolifically in foreign waters that they suppress local species. The International Maritime Organization’s International Ballast Water Management Convention therefore stipulates that ballast water must be purified in future.